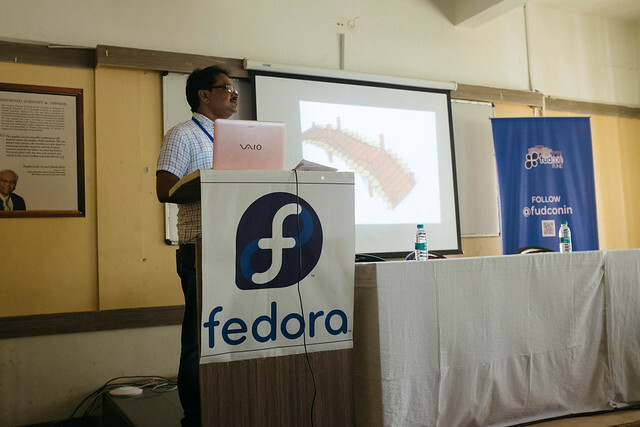 Kaji Nizamuddin is the headmaster of Bijra High School, he gave a talk in FUDCon Pune about the usage on FOSS and Fedora in his school. I am publishing his feedback email in my blog which he sent after the event. A very warm and sincere good wishes to all the members of the FUDCON team . I express my deepest gratitude and sincere thanks for sponsoring my trip as a speaker not only from the point of warm hospitality and respect that you have showered upon me but also from the point of useful lessons I learnt from the various sessions that I joined during the three days of conference. It was a novel experience in my life to share my views with a galaxy of stalwarts who are so technologically well advanced and updated. Hopefully all these technological improvements that have been earmarked will not only benefit the advancement of education but also they will be utilised for human welfare as a whole. The members of FUDCON fraternity conducted the conference in such a well planned and well organised manner that a beautiful environment of learning was created. The question - answer sessions have been so rewarding. The students of MIT and other colleges who came to take part in the conference had a tete-a-tete with the national and international speakers and I think this mutual response has made the purpose of this conference more meaningful and significant. I personally feel that our FEDORA contributors who work with yearlong lucubration for the cause of Free and Open Source Software have a very broad outlook, magnanimity and a cosmopolitan heart. They are really the men and women of vision.It was rather a lifetime event for me to witness and cherish the memory of the persons who work under the global FEDORA umbrella and to share their views with each other. I came back with enough enlightenment and zeal. Therefore I wish to contribute more into such projects. I do confess here that I am not so well -versed with the technical aspects of all these projects but I swear I will keep myself abreast in the development . Hence I need your guidance and help to update myself. Once again all FUDCON 2015 members for being so kind and treating me in such a special way. I felt honoured and privileged and hope that the next FUDCON will be as successful and as rewarding as this one . Wishing you all the best. With sincere regards and warm wishes.